A great favor with your custom message is all in the cards for your guests! 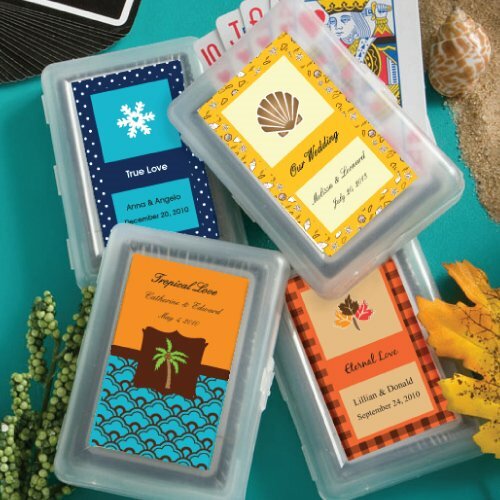 Choose your favorite theme, background color and border color, then add your names and event date and we'll create a custom sticker that you can easily attach to the hard plastic playing card case. The stickers come on pre-cut, self sticking sheets and are easy to peel off and stick onto the case. Each measures 2.5" x 3.75" x 0.75" and includes a full playing card deck inside (bulk shipped, minimal assembly required to adhere the labels to each favor). The playing cards themselves are NOT personalized. Note that personalization will be done as shown, with the first line above the graphic, and lines 2 and 3 below. 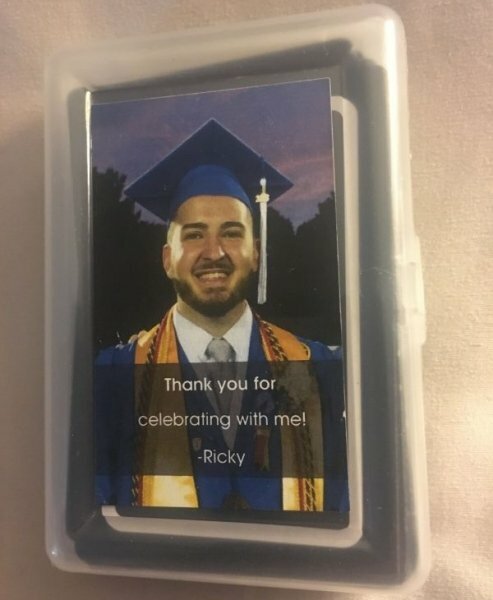 I just customized an order for playing card favors and when I was all done it told me to go back to the PRODUCT page. Where would that be? 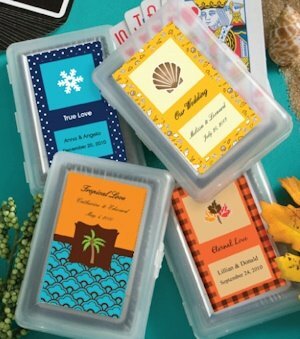 The product page is in the shopping cart after adding the Custom Seasonal Theme Playing Card Favors. You will be able to make your selections in the personalization info there. It will not auto-fill in the cart. You will need to manually make your selections. In the upper right corner of the preview tool you'll see My Choices. There it will list the name of your selections.